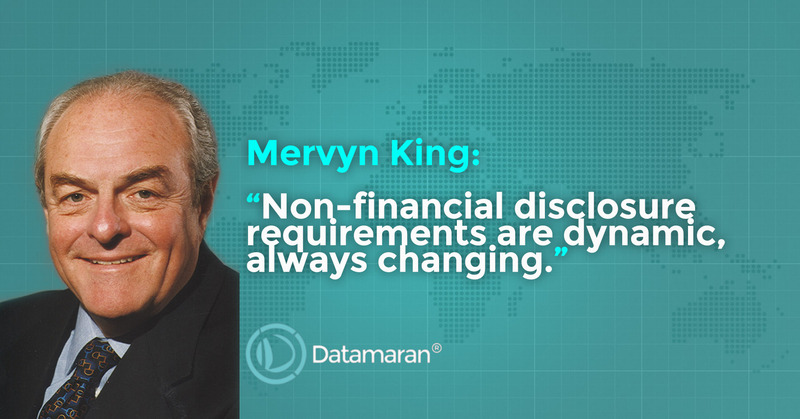 Our partners at MaterialityTracker have just published a very interesting article highlighting Mervyn King’s (former Judge of the Supreme Court of South Africa and Chairman of the King Committee on Corporate Governance in South Africa) views on non-financial disclosure requirements and their importance when defining materiality. There are differences in how materiality is defined by the accounting profession, the legal profession, courts, stock exchanges and regulators. Materiality has been molded over 100 years via legal judgments and court decisions, as well as by accounting standards bodies. Lack of agreement across the Atlantic on what constitutes common international standards for financial reporting has led, among others, to a proliferation in definitions of materiality. It is against this background that as IIRC Chairman I asked the heads of the internationally leading reporting standards bodies to join a discussion under the Corporate Reporting Dialogue. Today they collectively look into overlap and convergence. They’ve come up with an agreed general definition of materiality, and now have a basis from which to tackle more technical matters such as appropriate thresholds to apply in determining materiality. In judging on materiality, legal experts and courts consider any public disclosures, not only reports or annual statements as such. They ask what is material to a case issue involved, material to the matter of dispute between two parties, or material to the business of a company. That is different to material matters where an accountant or auditor looks at report preparation or assurance of its material content. Levels of materiality will also differ from company to company. It depends on contextual factors such as industry, market and historical track record of the company. New information technology and data analytics will help tremendously in improving analysis of data and circumstances relevant to a company. The work gets automated versus being done by young analysts. There is definitely an issue of information overload, and what is reported daily in the media – including social media – is not necessarily the best guide to what is most material to individual companies. But if there is a legal dispute between a company and someone, any public statement will be assessed in the context of determining the relative credibility of two parties involved in a dispute. In the litigious society that is the USA, much weight is put on use of the term materiality from an evidential point of view. As a result lawyers advise people not to use terms such as materiality outside of their statutory filings. The assumption is that materiality implies clear financial consequences, and the term should not be used loosely, certainly not inconsistently between different types of reports. But more weight should not be given to statutory documents. The question of materiality should be treated on the basis of parity when it comes to reporting on matters which could result in the reader or user drawing a different conclusion from the one reported. It doesn’t follow since the term appears in a statutory document that you should give more weight to it. When you are complying with a statutory requirement there is always the factor of mindless compliance. You don’t apply your mind to the question of what is material or not, and you end up with so-called boilerplate disclosures. Mindless compliance implies there is no application of the collective mind of a Board on the issues involved. Financial accounting standards recognize that deciding on materiality involves considering not only financial and quantitative information, but also non-financial and qualitative information. Behind a quantitative financial figure, there is lots of judgment, valuation and application of standards to come up with a number that is presented as a fair statement of the financial position of a company. Thus there is a qualitative aspect to the quantitative number. In making those judgment calls managers consider what is significant and what is important in valuing for example a major asset. Eventually the auditor will say I have examined this and believe it is a reasonable conclusion. He gives a reasonable assurance audit of that number. But qualitative judgment calls went into the decision-making process. The financial statement on face of it is quantitative, but there is extensive qualitative reflection underneath it. From a qualitative judgment point of view, you also have to feed sustainability trends into your assessment of risks. Consider that we now have extinction accounting, applied by for example a food retailer when assessing the consequences of the depletion of bee populations. These include the impact of decreasing pollination for wheat production, implications for supply risks and ultimately for a fair presentation of the financial position of the food retailer. In our resource deprived world, extinction accounting is becoming an important discipline. This includes valuation of Natural Capital and its translation into financial figures. Of course, you cannot monetize everything and you cannot divorce it from the judgmental call being made because a risk has to be accounted for. New research is considering whether we should stop calling things “financial and non-financial”, since the non-financial can easily destroy a company. Maybe we should just refer to “assets and liabilities”.